"I see you have constructed a new lightsaber. Your skills are complete. Indeed, you are powerful, as the Emperor has foreseen." Even if you don't feel the need to brag, as you master your skills and gain power, others will notice. This was true of Luke Skywalker as Darth Vader recognized the young Jedi's progress, and it's true of every fan of Star Wars™: Destiny who participates in Organized Play and casually plays with a deck full of alternate art and extended art cards. These cards don't make you more powerful, but they serve as an outward sign of your skills and confidence. They stand testament to the games you've played and won—even to the games that you've lost and from which you've learned the most valuable lessons. 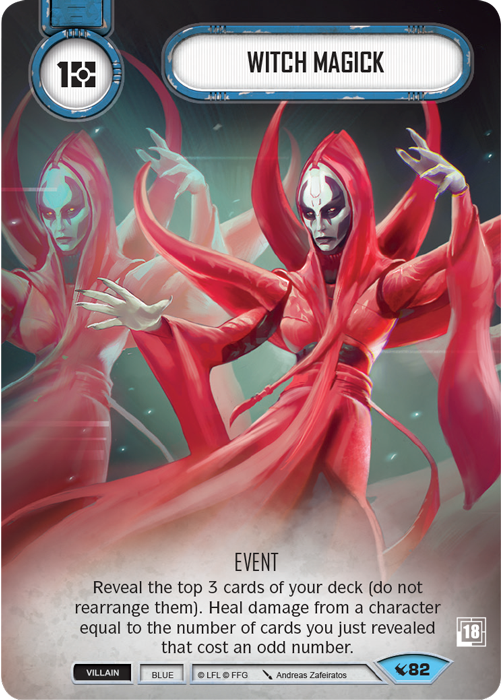 So as you look forward to the fourth season of Star Wars: Destiny Organized Play for 2018, what will your opponents notice as they look at you? What signs of power will they recognize? What will you find in the Season Four prizes to add to your decks? While your local tournament organizer can use the contents of any Star Wars: Destiny Tournament Kit to support whatever type of event is best for your community—whether a demonstration, new player night, or casual league—they are most commonly awarded as the prizes at the game's local Clash of Fates tournaments. 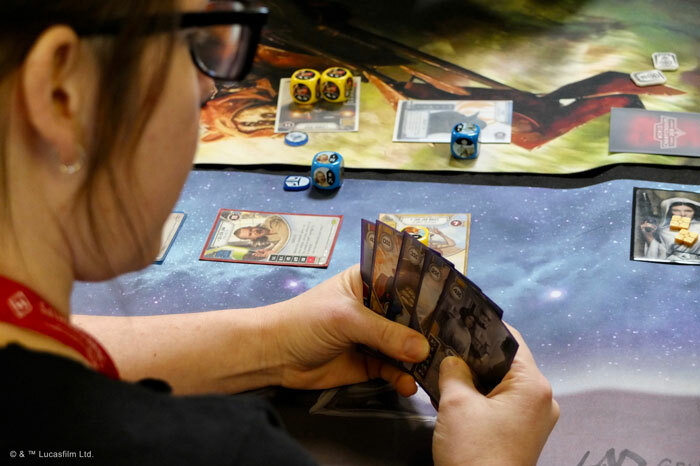 Each Clash of Fates tournament thrusts participants into the heart of Star Wars: Destiny's back-and-forth, dice-and-card duels for three rounds of Swiss play. The format is short enough for a weeknight… but long enough to send squadrons of X-wings on strafing runs against your enemy's characters, spend time with the Nightsisters and their witch magick, and discover the most impactful ways to use your characters' Power Actions. Whether you fight for the light side of the Force or the dark side, you'll find prizes in the Star Wars: Destiny 2018 Season Four Tournament Kit to serve as symbols of your growing power. 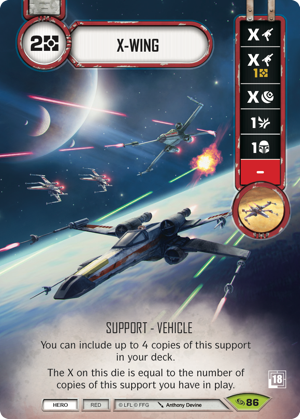 The Tournament Kit contains seventeen copies of an alternate art version of the new X-Wing support from the Across the Galaxy set, illustrated by Anthony Devine. Here, we see the X-wing flying with the rest of its squadron and taking the fight to the Empire. One copy of this card is intended for the tournament organizer to keep or distribute as he or she sees fit; the other sixteen are to be awarded to participants in the season's Organized Play. At a Clash of Fates tournament, the Top 16 players should each receive a copy. 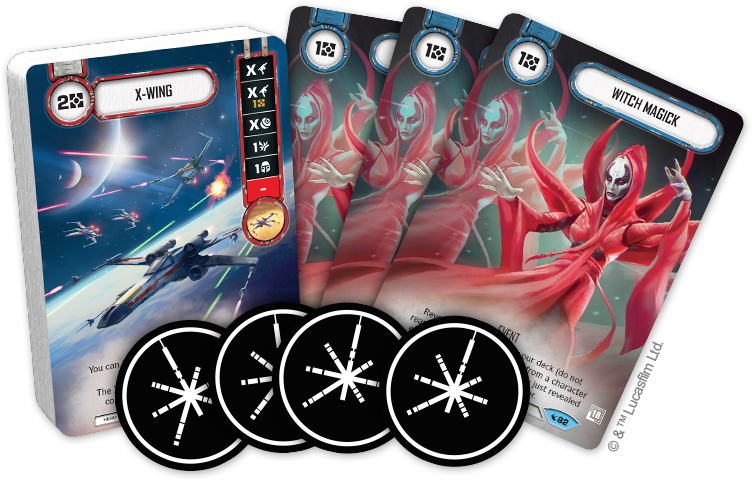 From the alternate art card that explores the starfighter battles raging among the stars, we turn to an extended art card that reveals more of the Nightsisters of Dathomir and their Witch Magick. There are three copies of this popular event in each 2018 Season Four Tournament Kit. One is again intended for the tournament organizer, and the other two are awarded as elite prizes. At a Clash of Fates tournament, these elite prizes are awarded to the top participants in the order of their finish, with each choosing to claim either one copy of this alternate art card or one set of the tokens awarded as the other elite prize. The 2018 Season Four Tournament Kit comes with two sets of power tokens with paint on black acrylic. Each set contains four tokens, meaning your victory should secure you enough tokens to trigger all your Power Actions with the confidence—and the poise or menace—of an accomplished Force user. Talk to your local retailer about getting involved with 2018 Season Four Organized Play for Star Wars: Destiny!